Today, as we commemorate Pearl Harbor Day, the American flag again flies proudly over the original Buhl Planetarium and Institute of Popular Science building, which is now used by the Children's Museum of Pittsburgh. The historic Buhl Planetarium flag pole, which was erected and started use with the opening of the building in October of 1939, was refurbished and returned to use last month, in time for Veterans' Day. A second historic flag pole, built atop the Old Allegheny Post Office building (also now used by the Children's Museum of Pittsburgh) in 1897, is also back-in-use. A flag displaying the Children's Museum's "HI" logo now flies on this flag pole. Angelo Galioto, a chef in the Children's Museum's "Big Red Room Cafe" (in Buhl Planetarium's Great Hall), spearheaded the drive to refurbish and reuse the historic Buhl Planetarium flag pole. A veteran of the U.S. Navy, Mr. Galioto originally voiced his displeasure with the condition of a huge artifact, the original anchor from the USS Pittsburgh (Baltimore-class heavy cruiser which served during World War II), which is displayed on the Allegheny Square Plaza near the flag pole. Originally preserved by the Pittsburgh History and Landmarks Foundation (which hosted a city history museum in the Old Allegheny Post Office, before the Children's Museum was established) , Mr. Galioto and his brother Frank (also a Navy Veteran) sought to have the anchor painted and the area cleaned-up. Frank Galioto, a retired union worker, enlisted the aid of Joseph Delale, the AFL-CIO Community Services Liaison with the Allegheny County Labor Council, who in-turn called-on Giles Grinko, Business Representative from the Painters Union (IUPAT D.C.57). At a meeting, they all agreed that the job could be accomplished by taking advantage of the apprenticeship program of the IUPAT D.C.57 union. They also decided to install a new flag pole with an American flag, directly beside the anchor. After making an official request to the Children's Museum, Children's Museum Deputy Director Chris Siefert pointed-out that the property they were referring to is legally a right-of-way of the City of Pittsburgh. Before the 1960s construction of the original Allegheny Square Plaza and the office, retail, and apartment building complex known as Allegheny Center (originally developed by ALCOA), where several streets became pedestrian plazas, the area where the anchor is located was originally West Ohio Street at the intersection with Federal Street. After speaking with city officials, Mr. Siefert suggested that the group consider refurbishing and reusing the original Buhl Planetarium flag pole (as with the Buhl Planetarium building and lawn, the flag pole is City property), which was near the anchor. The Buhl Planetarium flag pole (height: over 30 feet) had not been used for more than 20 years, when the SpaceWatchtower blog editor / author, Glenn A. Walsh, had used the flag pole to raise and lower the American flag on major American holidays, for Pittsburgh's original Buhl Planetarium and Institute of Popular Science (a.k.a. Buhl Science Center). 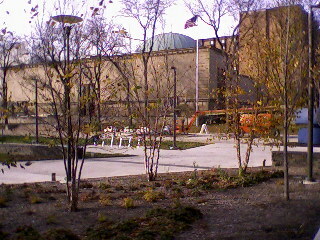 By this time, this area of the Buhl Planetarium lawn was overgrown with trees, making display of the American flag difficult to view. Mr. Siefert arranged for the City of Pittsburgh Department of Forestry to remove one tree and trim the remaining trees, to enable better visibility of the flag pole. The Painters Union cleaned and painted this very tall flag pole, with the help of the Duquesne Light Company, their IBEW union local 29 employees, and the company's bucket truck. Through their Power of Light program, Duquesne Light also set-up night-lighting for the flag pole, so the American flag could be displayed 24 / 7 / 365. Although there are no legal penalties for a violation, the U.S. Flag Code instructs that the American flag should always be illuminated, when displayed at night. The U.S. Supreme Court has ruled that any penalties for violation of the U.S. Flag Code would conflict with the right of Freedom of Speech in the First Amendment to the U.S. Constitution. Finally, U.S. Congressman Mike Doyle (who represents the congressional district which includes the Buhl Planetarium building) donated a new 5x8 American flag for use on the refurbished Buhl Planetarium flag pole. As with the American flag Mr. Walsh received, for the Buhl Planetarium flag pole about 25 years earlier from Mike Doyle's predecessor Congressman William J. Coyne, this new American flag had once flown over the U.S. Capitol building. Giles Grinko, IUPAT D.C. 57 Business Rep.
Joe Delale, Allegheny County Labor Council, AFL-CIO Community Services Liaison. Special Thanks from the SpaceWatchtower: Chris Siefert, Deputy Director, Children's Museum of Pittsburgh. End of Research at Lick Observatory ? Smallest Full Moon of Year: Dec. 17, 4:28 a.m.
Salty Water Seen Flowing Down Martian Slopes ?